The only tool you need for construction project management. 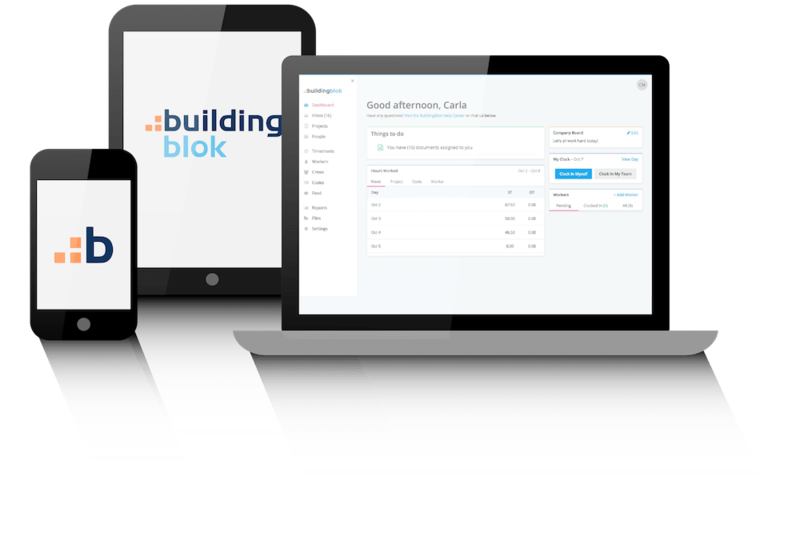 BuildingBlok is an extremely easy-to-use construction project management software that connects your team, all your project data, and devices in one central hub. What is effective construction project management? Effective construction project management is more than a checklist of tasks to be completed. It means maintaining a seamless project workflow in order to consistently deliver projects on-time and on-budget. Construction management software, like BuildingBlok, empowers construction professionals to do just that. Why do you need project management software? If you don’t have clear visibility into the health of your project or if you’re wasting time resolving miscommunication, organizing massive spreadsheets or searching through emails for misplaced documents, you need BuildingBlok. Our Timesheets and Daily Reports tools are fully integrated, easy to use, and mobile. Your team can clock-in and -out from their mobile devices - even when they’re offline. GPS location tracking ensures that your crews are in the right place at the right time. Input data directly from the jobsite to track your project's progress in real-time. Foster a culture of communication and collaboration so you can manage multiple projects, in one place, with total visibility. Unlimited users ensures that your entire team collaborates in real-time, even when they’re miles apart. Immediate access to project documents guarantees everyone is on the same page. Consistently delivering profitable projects requires timely access to trusted financial reports. Streamline your finanical reporting process by allowing users to create change orders, invoices and payment applications in one place. Track your latest financials to maximize profit margins.